This time it’s a request from the gaming club The Warheads and we are going to cover Psychic powers, or more specifically things that stop them. So let’s set up a few scenarios. A sinister Slaaneshi Daemon Prince tries to cast Lash of Submission on a squad of Space Wolves near a Rune Priest, if the Prince tried the same on a squad of Grey Knights near a Dreadnought with Reinforced Aegis, would he be more or less likely to succeed? Type 2) effects that happen after the psychic test to try to block the power, e.g. the leadership roll-off for a psychic hood, or the 4+ nullify from a Rune priest. Spacewolves can have a special ‘layered approach’ where they get a 5+ nullify from a Wolf Tail Talisman, and if that fails they can then try the 4+ from the Rune Priest. If the Rune Priest happens to be Njal Stormcaller then that 4+ becomes a 3+. But even with all that wolf-cheese, the master of psychic defense has to be Khorne. The effectiveness of Psychic Hoods varies depending on the relative leadership values of the defender versus the caster. If the caster has a low Ld compared to the defender then he’ll have a very tough time. So for all these ‘Type 2’ defenses I’ve simply calculated the odds of blocking the psychic power (assuming that the psychic test is passed). For the hood I’ve calculated it for all possible differences of leadership value between caster and defender. I’m sure the range encountered in practice is smaller, but I did it simply for completeness. Ok so that’s Type 2 defenses, what about those Type 1s? 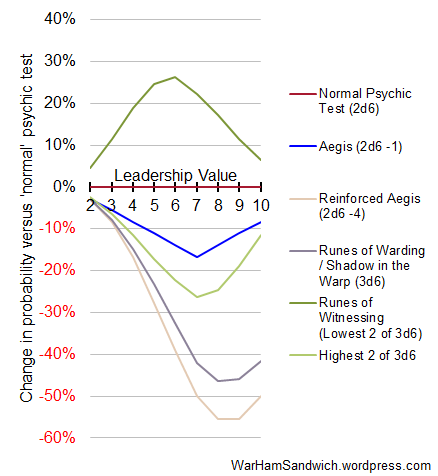 I start by graphing how the odds of passing the psychic test vary with increasing leadership, for a variety of scenarios (including Runes of Witnessing which are not a defense at all, they are there to improve a casters chances of passing). So we get a set of S curves, where the red curve represents a ‘normal psychic test’ and any curve below it is hampered by a defense. The lower the curve in the graph, the stronger the defense. As you can see the Reinforced Aegis is the meanest of the lot. It is worth noting that the Runes of Warding give a perils result on any result of 12 or above, and increases the odds of a double 1 to push the odds of perils from about 5.6% up to nearly 45%, that is a serious threat in its own right. While this clearly shows the effect of the defenses, it can be a bit tricky to read the actual impact of the defense. So with that in mind I’ve also plotted the difference each defense makes for a given Ld value, shown below. This shows specifically what these defenses are worth against a given Ld. The Normal Psychic test is a flat red line as it compares exactly to itself (if you get what I mean). 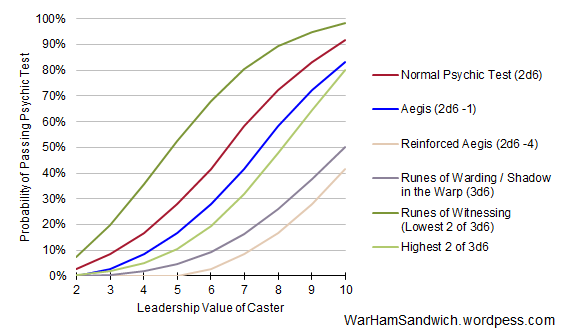 Runes of Witnessing are above the line as they improve the odds of casting, and the defenses are below the line because they reduce the odds of passing. So what about that original question? Which target is easier for the Daemon Prince. Well he’s Ld10 so under normal circumstances he has a 92% chance of passing his psychic test, the Rune priest has a 50% chance of blocking him if he’s successful giving an overall probability of 46% for making the Lash. With the Reinforced Aegis, the odds of making the psychic test drop to 42% making it slightly more effective than the Rune Priest. I’m sure there are lots of particular scenarios you could come up with, and hopefully I’ve given you the data to be able to make like for like comparisons, but don’t be afraid to put a request in for a specific situation if you can’t work it out! This entry was posted on Wednesday, September 21st, 2011 at 9:42 am	and posted in Probability. You can follow any responses to this entry through the RSS 2.0 feed.